Yesterday I received a little sunshine in my mailbox from Magic Mentha. I won her Blogiversary Giveaway of a Tarot: The Complete Kit, along with a couple of other thoughtful goodies thrown in just because MM is a sweetie. 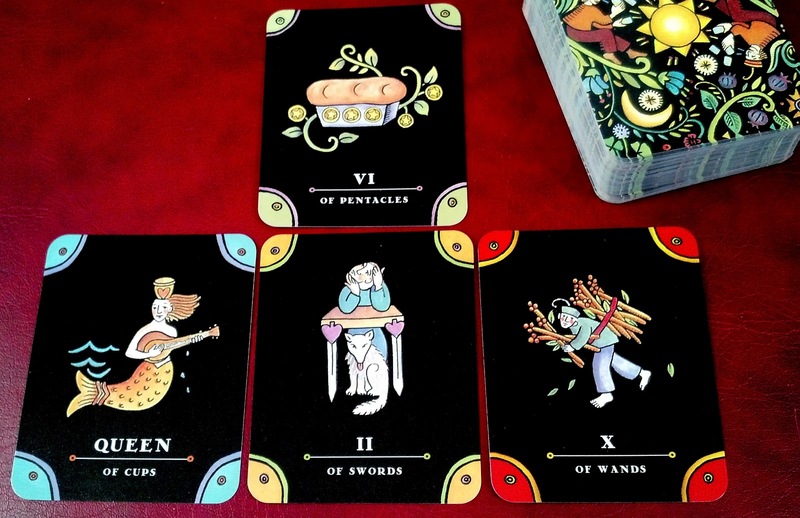 This is a cute little tarot deck, and I love it! Thanks, MM! I dove right in and used the suggested spread that came with the kit. What's at hand? Six of Pentacles. This card makes me think of giving and receiving, which is very appropriate for this time of year. The loaf of bread shown on this card is perfect because this is the time of year that I find myself doing a lot of baking. In fact, this weekend I'll be baking another birthday cake. We're having family over for a birthday party for my fourteen year old, which reminds me, I still need to buy her gift! I also have a pretty messy house to clean up, but this card isn't just about giving. It's also about receiving, so I think I will "receive" plenty of help from my husband and kids. Past influences? Queen of Cups. This card speaks to me about my relationship with my family, and in the past, this has been a hard time of year for me. There is so much I want to do to make this time special for them, and I feel like I never quite measure up. The drops of water next to the queen makes me think of tears, and the downside of this queen is that sometimes she doesn't see things clearly because she can get a little stressed out. Maybe she is putting too much pressure on herself, trying so hard to make everyone else happy. She needs to remember to love herself too. That's another message I have gotten from this card repeatedly. The little book that came with this deck says, "Don't get bogged down by trivial details or the demands of others," and that speaks to me right now. Ponder this. Two of Swords. Maybe I don't have to "do it all." Maybe this card is asking me to think about what is really important, so I can make some choices about where to apply myself. Maybe I will have to disappoint some people in the process, but I do need to think clearly and choose wisely. That white dog under the table sticking his tongue out at me will get over it. He's still there at the ponderer's feet, right? What to do? Ten of Wands. I need to recognize that I feel incredibly burdened every year around this time, so perhaps this year it's time to approach things differently. In fact, the little book says, "Break out of stubborn patterns and look for new approaches." That sounds really good to me! I've been feeling a sense of dread as the days tick past. I've been wanting to hide my head in the sand and do nothing, but that will insure that I have another stressful holiday season. It has become a pattern that I willingly break this year. Instead of feeling stressed and glad when it's all over, I'm going to think of ways to make this a relaxed and special time for me and my family. Beautiful reading! I think this is an excellent holiday reading. It is amazing how much stress the holidays can put on people. Over time, I've done less and less around the holidays, which has reduced my stress level. I still feel pressure to visit out of state family, but my daughter's mood, behavior and health issues, lack of money, and changing priorities, make it easier for me to just say no. I think some of the stress is positive-baking and presents can be fun, but it's also expensive and stress-inducing. Oye!!! Anyway, I'm so glad the package brightened your day and I send you a most peaceful holiday season. Yes, we have lots of extended family close by, and it can be hard to spend time with everyone, and expensive to share gifts with everyone. We've pretty much got that all worked out, but it always seems like there is someone who is unhappy with the way it all works out, either time spent or gifts given. Sigh. I hope I can follow this advice too! :-) It will take reminding myself of it a couple of times. I love that there's a loaf of bread in the Six of Pentacles! That feels so perfect for your reading. Not just the fact that Christmas is associated by many with baking (it's pretty much the only time I bake German-style cookies like my grandma taught me), but because the loaf is a sign of hospitality and sharing: breaking bread together! Wishing you luck with managing the stress of the holidays. Hospitality! Yes! I couldn't quite put my finger on the feeling that came to mind when I saw that loaf of bread, but that's it. That's the feeling I want to have and give this holiday season. It's what I always shoot for, but I over-extend myself and start to feel exhausted and stressed. Those German style cookies sound marvelous. I spent four of my growing up years in Germany, and have many fond (and yummy) Christmas memories from there.